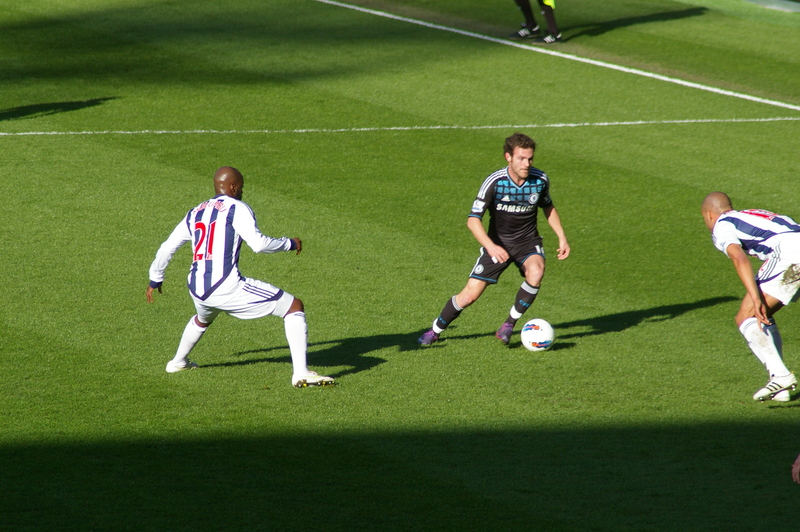 West Bromwich Albion vs. Chelsea : 3 March 2012. I peered out of my window at 8am and it was overcast and grey. By the time I had reached Lord Porky’s village at 9am, the sun had appeared from behind the low-lying clouds. It was going to be a fine day. I had a quick chat with Porky’s partner Jill, who was babysitting her granddaughter Kayla, just turned two and a lifetime of Chelsea heartache ahead of her. Kayla has just started talking and I have no doubt that some of her first words will be Chelsea-related. I mentioned to Jill that I have been suffering, for the first time in my life, with eczema for the past three months. Both hands are affected, though only slightly. She mentioned that eczema is a sign of stress and this surprised me; I haven’t felt under duress the past few months. I slapped some Nivea hand crème on and departed, stopping at McMelksham for a breakfast on the hoof. We drove north on the Fosse Way once more; slightly longer, compared to the going via the Almondsbury M4/M5 intersection, but a lot more scenic and rewarding. The away jaunt to The Hawthorns represents one of the shortest away trips for me at the moment. Swansea is the nearest at a mere 102 miles. This would be my seventh trip to the home of West Bromwich Albion. We had won all previous six encounters and there have been some pretty good memories amongst those games. My first visit was in January 1986 when I was studying for my geography degree at North Staffordshire Poly in nearby Stoke-on Trent. In 1985-1986, we were flying. The much-loved John Neal had guided us to promotion and First Division respectability during the previous two seasons and we had launched a full-on attack on the league title over the Christmas 1985 period. A 2-0 win over Tottenham in front of a mammoth 37,000 was a formality. Newspaper articles proclaimed that we were genuine contenders and I, aged just twenty, was lapping it up. Here are a few notes from my diary entry of Saturday 18th. January 1986. Twenty-six years on, a few more things to add. We played in all red that day; one of the last times we were to do so, in fact. There was always a certain cachet to take over the seats at away games in the mid-‘eighties; this activity was especially favoured by London clubs, whose fans always seemed to have a little more money spare on match days. For a few, there was always a greater chance to meet and greet certain sections of the home fans in these areas too. I’m not condoning this by the way – just reporting it. Of course, having a few thousand in the seats, always made the mass singing of “One Man Went To Mow” that more enjoyable when we all stood on “10.” The home fans, cowering alongside, often watched on in silent bemusement. On exiting the steps down from the Rainbow Stand after the final whistle, the Chelsea choir began singing “We’re gonna win it all.” And I remember that this felt quite possible. We were in all four competitions (the League, the FA Cup, the Milk Cup, the Full Members’ Cup) and we were on fire. Sadly, this proud boast went up in flames as Liverpool beat us at home in the FA cup and Kerry Dixon, our superb young striker, pulled up with a torn calf-muscle after only ten minutes. Kerry was out for quite a while and, although he made England’s World Cup squad for Mexico in the summer, he would never be quite the same player. His absence from the team was certainly a major reason why our challenge for all of the honours soon fell away over the next two months of that memorable 1985-1986 season. On the Wednesday after that Liverpool defeat, we lost at home to QPR in the Milk Cup and a few defeats in the League meant that we were soon out of the running of the title, too. In fact, the high water mark of that great Chelsea team (1983 to 1986) was arguably that afternoon at The Hawthorns. In the end, our 5-4 victory over Manchester City in the final of the inaugural, and much derided, Full Members’ Cup was our only silver wear from 1985-1986. But that, as they say, is another story. And then we laughed at how the internet has turned post-game analysis into a deeply depressing experience of late. We both agreed that had the internet be around in the 1978-1978 season (and the 1982-1983 season too), several social network sites would be in meltdown with all of the negativity and bile being bounded around. There were certain ribald comments made by Big John, Lord Porky and myself about me being – momentarily – one degree of separation from the luscious Ms. Bleakley. Let’s leave it there. Jesus joined us for the last thirty minutes and we spoke about a few football-related topics. He explained a few things to me about the Mexican football scene and told me that he was present, in the Chelsea corner, at both the Bluewings and Galaxy games in LA in 2007. I said that I’d have to check my photos to see if I could spot him. At 2.30pm, we set off for the short walk to The Hawthorns. It was a typical Saturday scene with the onrushing fans heading off to the match, past the hot dog, burger and roast pork food stalls. At the corner, Jesus bought a small packet of pork scratchings for the three of us to share on the small walk down to the away entrance at the Smethwick End. There was a longer than usual wait at the gates – enough time for Parky and I to be reunited with a gaggle of Chelsea from Trowbridge, who had travelled up by train. They had actually spent their pre-match, by chance, with Alan and Gary in Birmingham city centre pub. After a thorough search, I was in. I bumped into Fiona and Ronnie, who had been in The Vine; Fiona had sadly reported that a few members of “The Youth” had started throwing bottles around inside the pub, causing a window to be broken. Only one word for that; pathetic. The game had started by the time I eventually found myself alongside Alan (yes, the same Alan from 1986) and Gary, my away day companions. The team was as strong as I could have hoped for, with the two stalwarts Lampard and Essien alongside Ramires. I had a quick look around The Hawthorns. The old Rainbow Stand had been replaced around ten years ago by a single-tiered structure, with the corners enclosed by acres of dull grey steel. These areas cry out for a Chelsea style flag or emblem. The corners, though unsightly, at least keep the noise in. I noticed that a new row of executive boxes had been installed at the rear of this stand since the visit at the end of last season. Ah, last season; the day that we joyously celebrated the fact that we were “gonna win fcuk all.” How times change. It was odd to see the boys attacking us in the first-half. A fine strike from Michael Essien was headed for a top corner, but custodian Ben Foster tipped the effort over. With the half-time whistle approaching, a gorgeous ball from the otherwise quiet Didier Drogba found Daniel Sturridge. Studge had been his usual self; shooting at the earliest opportunity, much to the chagrin of us all. On this occasion, he lost his marker with a nice body sway, but annoyingly drilled his low shot wide of the left-hand post. The Chelsea support was spasmodic at best. However, one thing pleased me. With the sixth anniversary of the passing of Peter Osgood on Thursday, the away fans often sang the trademark song. I was expecting a marked improvement in the second half, but it got worse. The sun disappeared and the clouds returned. The Chelsea support grew more and more frustrated with each minute of lazy play and half-hearted effort. After around ten minutes, a ball from Mata was played into acres of space for Studge to run onto. For once, our opponents were caught out playing a high-line. However, Sturridge misread the path of the ball and Foster met it first and cleared. More derision was aimed at the hapless Sturridge. I am quite befuddled by Sturridge. At times, his reluctance to pass to a colleague reaches ridiculous levels. No doubting his self-confidence, which is usually seen as a massive plus when assessing an attacker’s abilities, but his selfishness will weigh him down. There were more verses of “The King of Stamford Bridge.” However, West Brom were now in the ascendency and Petr Cech became the busier of the two ‘keepers. The away support wailed for the introduction of Fernando Torres. Overall, Drogba had been woeful, showing hardly any of his willingness to chase down balls and use his strength. However, Drogba stayed on and Nando replaced Essien. God bless him, Torres’ first action was met with roars of approval as he chased back and won the ball with a great tackle from behind. It was an abrupt wake-up call for us all; this is what we had been missing all bloody game. A player with passion. “The Lords’s my shepherd I’ll not want. He lays me down to die. In pasture’s green he leadeth me. You’re getting sacked in the morning. Of course, a fair few hundred Chelsea supporters joined in, too. I felt Alan bristling to say something. I just turned around and glowered. It was always my opinion that supporters are there for the team. It seems that certain sections of our support do not believe that this is correct. In the final flurry of activity at the Birmingham Road End, a great Ashley Cole cross was met by a Frank Lampard prod, but the ball flew past the far post and then Mata flashed wide too. Petr Cech went up field for one last corner, but the chance did not amount to anything. At the final whistle, I stood in more numbed silence. On a very bleak afternoon, only Torres, Cech, Lampard, Mata, Luiz and Drogba came over to clap the away fans, who – surprisingly, in my eyes – stood and clapped them for quite some time. That, at least, made me very very proud. However, that feeling soon subsided. Alan said “see you on Tuesday” but I could not speak. I simply nodded. As I waited outside the stand, several friends walked past. There were lots of long faces and I am sure I was exhibiting a particularly effective 1982-1983 style frown. However, Andy from Trowbridge approached and made me smile. “Keep your chin up, Chris” as he mimicked Mourinho at Arsenal in 2007. On the walk back to the car at the hotel, we had hoped to buy several bags of pork scratchings, but we couldn’t see any stands which were selling them. Lord Porky was distraught. A 1-0 defeat and no pork scratchings. Back in the hotel bar, a beer for Porky and a cappuccino for me. A quick word with Jonesy from Nuneaton. We both agreed that we had begun the season relatively well, but we were now seemingly getting worse with each game. I was still adamant that AVB should stay and get to the summer before clearing out the players who clearly do not fancy playing for him. …and I have a feeling that my bloody eczema is going to get a lot worse over the next few weeks. This entry was posted in Season 2011-2012. and tagged 1985-1986, 2011-2012, Andre Villas-Boas, Peter Osgood, Songs, Stadia by Chris Axon. Bookmark the permalink.